Description: Got weather? This board can handle it. The USB Weather Board includes onboard sensors for barometric pressure, humidity, temperature, and light level. We've also added headers in the new version so you can connect the board to the weather meters (not included), adding sensors for wind speed, wind direction, and rainfall. You can send all this data to a computer or datalogger via mini-USB cable, TTL serial (3.3V), or wirelessly via Bluetooth or XBee (not included). Finally, the board is Arduino-compatible for easy customization. This board has a wealth of headers for various sensor and communication connections. Check the related items below for the appropriate connecting hardware. Our weather meters can be connected to the weather board with the addition of RJ11connectors. 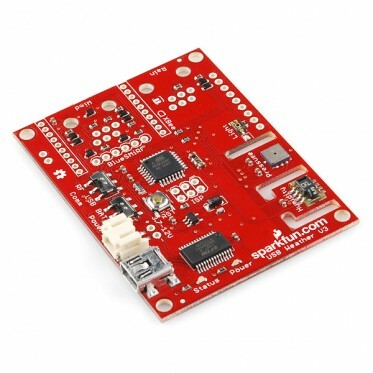 Wireless communication can be achieved through either Bluetooth, by the addition of 0.1" headers and a BlueSMiRF radio, or Zigbee by addition of an XBee radio and the appropriate XBee sockets. On-board sensors for Barometric pressure, Relative humidity, Ambient light and Temperature. 3.7-12VDC power can be supplied by USB, LiPo battery (JST connector), or other external source. Stock firmware allows you to choose between multiple units and output formats.